Friends may greet the family 3:00 - 8:00 p.m. Wednesday, January 16, 2019, at the Nashua Plainfield High School Gymnasium. Visitation continues and hour prior to the Funeral Service at the Nashua Plainfield High School Gymnasium. Caleb Rilee Ulrichs was born October 14, 2000, in Waterloo, IA, the son of Jeff and Victoria (Shannon) Ulrichs. 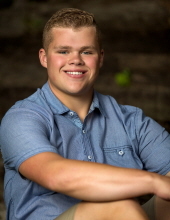 Caleb attended school at Nashua Plainfield where he would have graduated in spring of 2019. Caleb was active in National Honor Society, was a Gold Star recipient, a member of the Family Career Community Leaders of America, Third Degree Black Belt - Tae Kwon Do, participated in Dorian and multiple honor bands, was on the Husky Leadership team and was honored by his peers being chosen the 2018 Homecoming King. Caleb loved planning social events whether it was a get together with friends or being a part of the Over the Dam Days Committee. From these experiences, Caleb aspired to become an Event Planner. Caleb was an amazing son, brother, friend and all around person. His contagious smile and fun loving personality will be missed by all. He was preceded in death by his maternal great-grandparents, Paul (Fran) Shannon, James (Rosie) Kramer; paternal great-grandfathers, Delvin Koeff and Albert Ulrichs. To send flowers or a remembrance gift to the family of Caleb Ulrichs, please visit our Tribute Store. Memorials may be directed to the family for a memorial that will be dedicated in Caleb's honor. "Email Address" would like to share the life celebration of Caleb Ulrichs. Click on the "link" to go to share a favorite memory or leave a condolence message for the family.